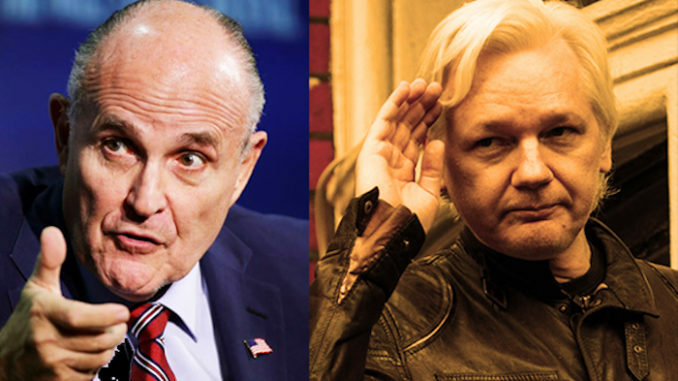 Donald Trump’s lawyer, Rudy Giuliani, has urged British authorities to set free WikiLeaks founder Julian Assange, declaring him to be a hero of free speech. Giuliani told Fox News that Assange had not done “anything wrong” and should not go to jail for publishing leaked information just as mainstream media does. “Let’s take the Pentagon Papers,” Giuliani told Fox News. “You can’t put Assange in a different position,” he said. Giuliani said, “We may not like what [Assange] communicates, but he was a media facility. He was putting that information out,” he said. The U.S. government has admitted that it has indicted Assange for publishing classified information, but it is battling in court to keep the details of the indictment secret. As a lawyer and close advisor to Trump, Giuliani could have influence on the president’s and the Justice Department’s thinking on Assange. Giuliani also said there was no coordination between the Trump campaign and WikiLeaks. “I was with Donald Trump day in and day out during the last four months of the campaign,” he said. Assange has been holed up as a refugee in the Ecuador embassy in London for the past six years fearing that if he were to leave British authorities would arrest him and extradite him to the U.S. for prosecution. Next Next post: Is This the End of the Age of Apple?